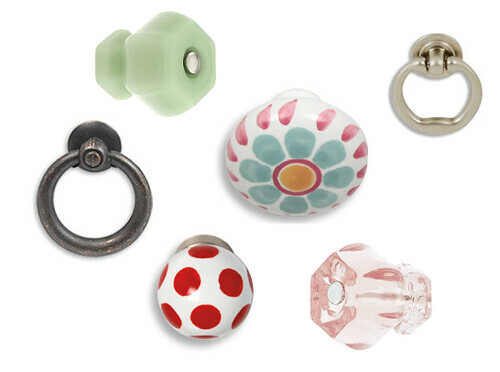 So Anthropologie is the easiest answer when it comes to shopping for cute knobs. But I need 7 knobs for my dresser and at Anthro they cost 6 to 12 bucks. So that's like 50 bucks, at the very least, on new hardware. Yikes. Here are a couple other resources I found, Cool Knobs and Pulls and House of Antique Hardware. UPDATE: Commenters pointed out Hobby Lobby also has great knobs for cheap. You guys are geniuses. I actually found that Hobby Lobby has a whole isle of knobs too! For way cheap. They seriously have everything. Yes I just bought some at Hobby Lobby and the whole aisle was 50% off. I love your blog. LOVE it. Thanks for this post - just bought a new house with tons of built in drawers, that have the saddest hardware ever. I've been saving for anthropologie knobs, but the sooner/cheaper the better! Also, I love your refurbished lamps. Can you post more info about what kind of paint, how you prepped them, technique, etc.? What are you know about furniture? .